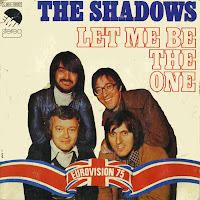 The Shadows, who are best known for their work with Cliff Richard in the Sixties, represented the United Kingdom during the 1975 Eurovision Song Contest with the song 'Let me be the one'. The song finished second in the Contest, behind Teach-In from the Netherlands with 'Ding-a-dong'. The single subsequently reached number 12 in the UK singles chart. It was also released in Europe, but without much chart success. This particular pressing comes from France. The Shadows were formed in the Fifties as a backing band for Cliff Richard, named the Drifters. A very successful career followed, with the personnel of the band frequently changing. One of the Shadows' best known tracks is the 'Theme from 'The Deer Hunter''. It was composed as 'Cavatina' by Stanley Myers. The piece had been recorded by classical guitarist John Williams, long before the film that made it famous. Following the release of the movie 'The Deer Hunter' in 1979, John Williams' instrumental version of 'Cavatina' became a UK Top 20 hit. Two other versions also made the Top 20 the same year - a vocal version by Iris Williams and another instrumental recording by The Shadows, with an electric guitar played by Hank Marvin. It peaked at number nine in the UK Singles chart. This 12" single is one of those rare double groove discs. 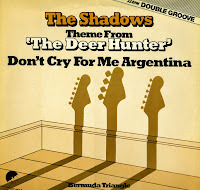 Depending on which groove you choose, the A-side plays either 'Theme from 'The Deer Hunter'', or the Shadows' previous single, 'Don't cry for me Argentina'. A wonderful item, which I'd seen a dozen times before - but never this cheap.